All of the speakers were very well received and the PowerPoint presentation  used by Andrés Portilla, Director of Regulatory Affairs at the Institute of International Finance (IIF) is now available for download. (1.3Mb) . 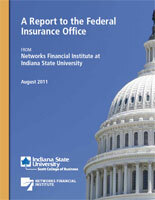 The report written by Networks Financial Institute for the Federal Insurance Office (FIO)  (PDF, 10.9Mb, 60 pages) is also available as is the report issued by the FIO itself, "How to Modernize and Improve the System of Insurance Regulation in the United States ." (PDF, 3.4Mb, 71 pages). "The Authority of the FSOC and the FSB to Designate SIFIs: Implications for the Regulation of Insurers in the United States after the Prudential Decision "